On most portraits of Linnaeus you can see the Linnea borealis, the plant that bore his name, and later also the Order of the Northern Star on his lapel. Portrait by Per Krafft Sr, Uppsala University collections. In recognition of his great services to science and to Sweden, Linnaeus was knighted in 1757. Up to this point his name had been Carl Linnaeus. His name as a nobleman became Carl von Linné. Linnaeus continued to work hard. During his lifetime he wrote 72 books and more than 300 scientific papers. He taught many students, several of them foreigners. 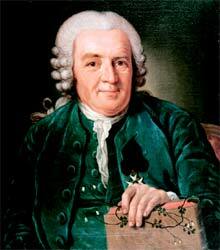 Linnaeus became an honorary member of scientific societies and academies all over the world. He made many influential friends, among them Catherine the Great of Russia who sent him seeds and plants from her own country. Linnaeus and his wife Sara Lisa saw five of their children reach maturity: four daughters and one son. Only the son, Carl Jr, was allowed to study. He did not have the same enthusiasm for Natural History as his father but nevertheless succeeded him as professor. In 1758 Linnaeus bought the estate of Hammarby (now known as Linnés Hammarby), 12 km outside Uppsala which became his summer home and moreover a good investment. Towards the end of his life Linnaeus was often ill. He suffered from gout, severe toothache and had several strokes.